flours, baking powder, and salt. 2. With an electric mixer on medium-high speed, cream butter, sugar, and vanilla until pale and fluffy. Add whole eggs and the white, one at a time, beating until each is incorporated, scraping down sides of bowl as needed. Reduce speed to low. Add flour mixture in two batches, alternating with the milk, and beating until well combined. Fold in chopped strawberries by hand. 3. Divide batter evenly among lined cups, filling each about three-quarters full. Bake, rotating tins halfway through, until golden brown and toothpick inserted in centers comes out clean, 25 to 30 minutes. Transfer tins to wire racks and cool 15 minutes; turn out cupcakes onto rack and let cool completely. Cupcakes can be stored up to 1 day at room temperature in airtight containers. 4. To finish, fill a pastry bag fitted with a large open-star (Ateco #826 or Wilton #8B) with buttercream. Pipe butter cream onto each cupcake, swirling tip and releasing as you pull up to form peak. 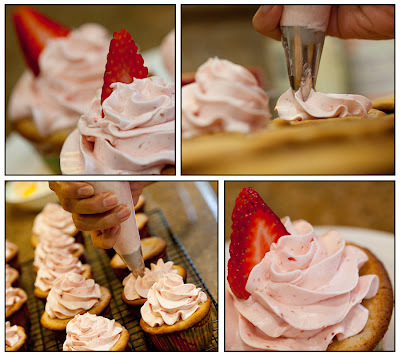 Just before serving, thinly slice strawberries, and tuck a few pieces into the butter cream. 1 ½ cups fresh strawberries (8 ounces), rinsed, hulled, and coarsely chopped. 2. Attach the bowl to the mixer fitted with the whisk attachment. Starting on low and gradually increasing to medium-high speed, mix until stiff (but not dry) peaks form. Continue mixing until the mixture is fluffy and glossy, and completely cool (test by touching the bottom of the bowl), about 10 minutes. 3. With mixer in medium-low speed, add the butter a few tablespoons at a time, mixing well after each addition. Once all the butter has been added, scrape down sides of bowl with a flexible spatula and switch to the paddle attachment; continue beating on low speed until all air bubbles are eliminated, about 2 minutes. Add strawberries and beat until well combined. Stir with a flexible spatula until the frosting is smooth. I've read lots of mixed reviews on this frosting... some say it is too liquid ... and too buttery ... that the recipe on her website is better w/o fresh strawberries but jam instead. Any thoughts on this? Does this frosting hold up overnight okay? I'm wanting to use an M1 perhaps instead of the 8B ... any thoughts you have are helpful!